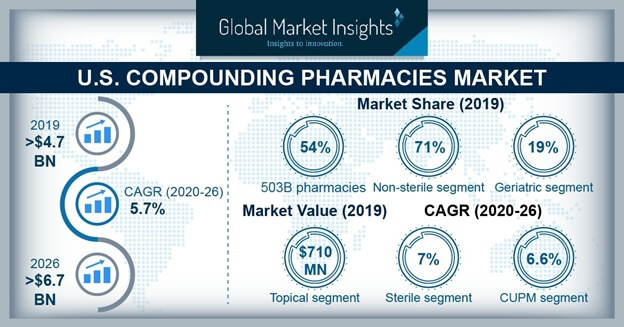 U.S. Compounding Pharmacies Market size is set to exceed USD 7 billion by 2025; according to a new research report by Global Market Insights, Inc. Growing prevalence of chronic diseases in the U.S. such as cancer, diabetes, cardiovascular disease, respiratory diseases and obesity will drive the U.S. compounding pharmacies market growth over the forecast period. Increasing drug shortage in the country due to production delays and unavailability of previously manufactured drugs in the market will surge the demand of compounded drugs. Timely availability of compounded drugs in the treatment of cardiac or other emergency conditions will thus foster the U.S. compounding pharmacies industry growth. Rise in the number of baby boomers susceptible to various chronic and non-communicable disease will render positive impact in the market growth. Ability of compounding pharmacies to formulate liquid dosage for patients with difficulty in swallowing pills and combine certain prescriptions into single dose enables patients to avoid administration of multiple doses. However, safety issues pertaining to compounded drugs coupled with continuously changing regulatory scenario may hamper the adoption of compounded medication thereby rendering negative impact on the business growth. 503B compounding pharmacy segment accounted for USD 2.5 billion in 2017 and is estimated to show lucrative growth over analysis period. The growth is attributable to the ability of these pharmacies to compound mass medication, thereby lowering production costs and increasing customer base. Non-sterile segment held the highest share of 67.7% in 2017 owing to increasing adoption of oral medication that offers convenience and ease of administration in patients of all age groups. Growing demand for oral liquid preparation and topical medication for pain management and anti-inflammatory therapies will further propel segment growth. Topical product segment is estimated to witness 5.3% CAGR over the analysis timeframe owing to increasing demand for topically administered drugs such as muscle relaxants, anti-inflammatories and anesthetics prescribed for pain management and inflammation therapy. Pediatric application segment held 14.5% market share in 2017 and is estimated to grow significantly during the forthcoming years. Ability of compounding pharmacies to transform standard drugs into flavored dosage and colorful forms will increase its acceptance among the children thereby accelerating the segmental growth. Pharmaceutical ingredient alteration (PIA) segment accounted for USD 1.7 billion in 2017 owing to rising demand for drugs compounded in accordance with specific patient needs such as hypoallergenic versions of drugs for individuals allergic to certain dyes or preservatives. Hormone replacement therapeutic segment is anticipated to show CAGR of 5.3% over the forecast period. Compounded hormone replacement therapy can be used specifically to suit individual body and hormone levels. Growing awareness among women regarding compounded bioidentical menopausal hormone therapy (BMHT) will further spur the segment growth. Some of the prominent players operating in U.S. compounding pharmacies market are Absolute Pharmacy, B. Braun Medical, Baxter, Cantrell Drug Company, Central Compounding Center, Clinigen Group, Dougherty’s Pharmacy, Fagron, Fresenius Kabi, ICU Medical, Institutional Pharmacy Solutions, Lorraine’s Pharmacy, McGuff Compounding Pharmacy Services, McKesson Corporation, Nephron Pharmaceuticals, Pencol Compounding Pharmacy, Pentec Health, PharMEDium, Premier Pharmacy Labs, Rx3 Compounding Pharmacy, RXQ Compounding Pharmacy, Triangle Compounding Pharmacies, Wedgewood Village Pharmacy and Wells Pharmacy Network. Key industry players are majorly focusing on mergers and acquisitions to broaden product portfolio and capture high revenue share.